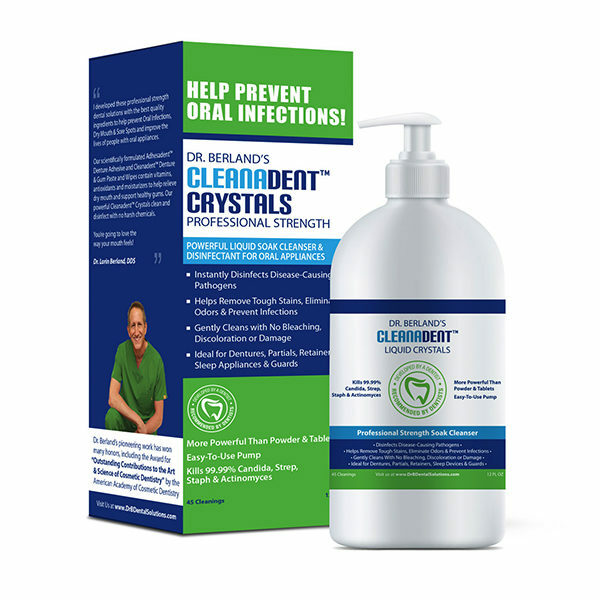 Cleanadent Liquid Crystals is the only soak cleanser that instantly kills pathogens like Candida, Strep, Staph and Actinomyces on all removable oral appliances out the use of harsh chemicals like bleach or chlorine. These pathogens are highly prevalent on oral appliances and are the leading causes of Oral Thrush, Stomatitis and Pneumonia. Anyone with an oral appliance is at a high risk of infection and should maintain a good daily oral hygiene routine. Cleanadent Liquid Crystals helps eliminate odor, remove heavy stains and disinfect appliances. Ideal for Dentures, Partials, Retainers, Aligners, Sleep Apnea Devices, Snoring Appliances, Mouth and Night Guards. Major brand cleansers only claim to kill “Odor-Causing” bacteria but do nothing against disease-causing pathogens like Candida, Strep and Staph. There really is no comparison. The Cleanadent™ Liquid Crystals Professional Strength Soak Cleanser is superior in every way. For best results, we recommend using the Dr. B SONIC CLEANER with Cleanadent Liquid Crystals. Our Sonic Cleaner is the perfect compliment to the Crystals as it uses high-frequency sonic waves to help loosen debris, and help the cleanser penetrate on a microscopic level. Visit our Cleaning Tips page to learn the best ways how to keep your dentures, nightguards, sportsguards, retainers, and snoring devices clean and disinfected. Ideal for Dentures, Partials, Retainers, Aligners, Sleep Apnea Devices, Snoring Appliances, Mouth and Night Guards. Safe for Dentures with Soft Relines and Partials Containing Metal, But Do Not Soak Overnight. Squirt 4 Pumps (8mL) of Cleanadent™ Liquid Crystals into 150 mL of water (about 1/3 cup or the size of the Dr. B Sonic Cleaner bath). Soak dental appliance for 5-20 minutes daily to clean. Rinse thoroughly under running water. *Safe on Soft Liners, but do not soak overnight. Do not use on partials with Ticonium Alloy (old discontinued material that was damaged by all cleansers). Do not put Cleanadent Liquid Crystals solution in mouth. Do not swallow. Keep away from eyes. Keep out of reach of children. Do not spill. Always see a dental professional for dental advice. Please dispense product with caution, over a sink. If any Cleanadent Liquid Crystals solution is accidentally spilled, please wipe with a disposable paper towel. This product has been tested by 3rd parties for safety and efficacy and was designed not to discolor the material on oral appliances, like plastic, acrylic, nylon, certain metals, etc. It was not designed for the softer material of fabrics, and as such may cause discoloration on those materials. For extra precaution, do not leave the Cleanadent Liquid Crystals bottle directly on a countertop, but on a paper towel or tray. Our upcoming Uni-Dose packaging will not have this issue, and will be perfect for travel! For best results: Use Cleanadent™ Liquid Crystals with the Dr. B Sonic Cleaner. Try our other innovative products, Cleanadent™ Paste & Cleanadent™ Wipes to loosen debris, clean the gums and help reduce Dry Mouth! If using a Sonic Cleaner, fill the denture receptacle with water, squirt in the Cleanadent Liquid Crystals, close the lid and move the switch on the back to “On”. Soak dental appliance for 5-20 minutes daily to clean. Remove loosened particles with a soft brush. Rinse thoroughly under running water. Extremely soiled dentures may require an overnight soak. Visit our Cleaning Tips page for more detailed instructions for specific oral appliances. This product does not contain bleach, alcohol, chlorine or other harsh chemicals, but the undiluted product does have a low pH. I love that mint flavor! Hats off to Dr. B!! Keep up the good work. Cleanadent Crystals are excellent- Much cleaner mouth guard with your product! I had a patient just last week whose thrush cleared up almost entirely just from using your Cleanadent crystals! Good job, Lorin! Wow, these little packets to clean appliances are powerful! It totally eliminates the smell of the appliance and makes it look clean like new in just minutes, not kidding. I started giving some to all of our denture patients after I used it on my own night guard. This stuff works great. I had a soft reline and now my denture fits much better. But I could never get it clean enough with any of the other soak cleansers. Now, after soaking in your Cleanadent Crystals my denture is cleaner than ever and in less time than the others! Great product! I am recommending this to all of my sleep appliance patients. I used it when I had thrush and it cleared up within days. I like knowing it protects me from candida, strep, and staph germs and makes my denture really clean.